Léeffet Éblouissement graduel rappelle l'effet que vous obtenez en prenant la photographie d'une source de lumière éblouissante, avec un halo et des radiations tout autour. L'image possède trois composants : la lueur qui est la groose boule de feu centrale, les rayons et les reflets secondaires. The Settings tab allows you to set manually the parameters while the Selector tab let you choose presets in a list. When Auto update preview is checked, parameter setting results are interactively displayed in preview without modifying the image until you click on OK button. You can set X and Y (pixels) coordinates of glint using the input box or by clicking into the preview. The coordinate origin is at the upper left corner. The radius of the effect. 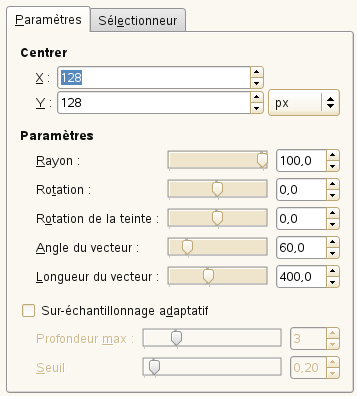 The slider limits the range of possible values, but using the input box you can enter greater values. Change the tint (color) of the effect. Vary the distance applied for the Second flares. L'onglet Sélectionneur vous permet de choisir un motif d'éblouissement existant, de le modifier et de le sauvegarder. 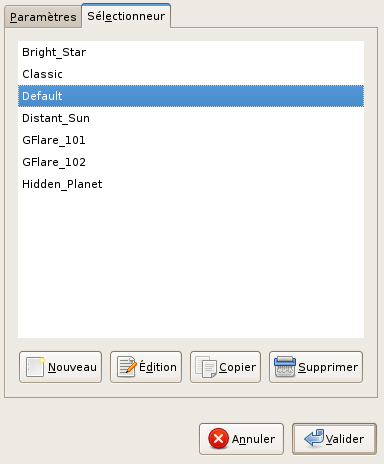 En cliquant sur ce bouton, vous ouvrez le motif sélectionné et vous pouvez l'utiliser pour en créer un nouveau avec un nouveau nom. This button brings up the Gradient Flare Editor (see below). Ce bouton vous permet de sauvegarder le motif remanié en le renommant. Ce bouton supprime le motif sélectionné. 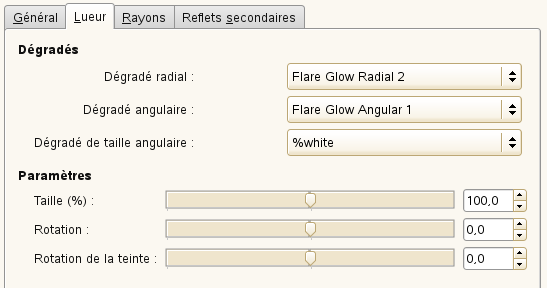 Slider and input box allows you to reduce glow opacity (0-100). In this mode, the glow covers the image without taking into account what is beneath. Pixel RGB values of glow are added to RGB values of the corresponding pixels in the image. 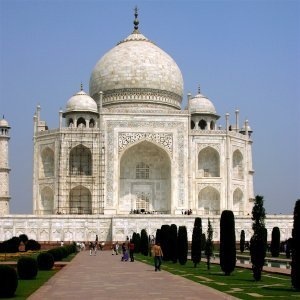 Colors get lighter and white areas may appear. Light/Dark areas of glow enhance corresponding light/dark areas of image. 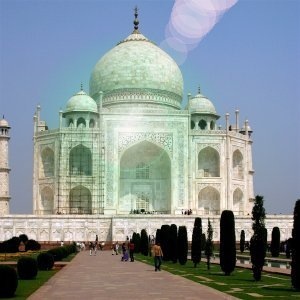 Dark areas of image are enlightened by corresponding light areas of glow. Imagine two slides projected onto the same screen. Options are the same as for Glow Paint Options. En cliquant sur les boutons rectangulaires, vous développez une longue liste de dégradés. Les dégradés précédés d'un « % » appartiennent à l'Éditeur. The selected gradient is drawn radially, from center to edge. The selected gradient develops around center, counter-clockwise, starting from three o'clock if the Rotation parameter is set to 0. Radial and angular gradients are combined according to the Multiply mode: light areas are enhanced and colors are mixed according to CMYK color system (that of your printer). This is a gradient of radius size which develops angularly. Radius is controlled according to gradient Luminosity: if luminosity is zero (black), the radius is 0%. 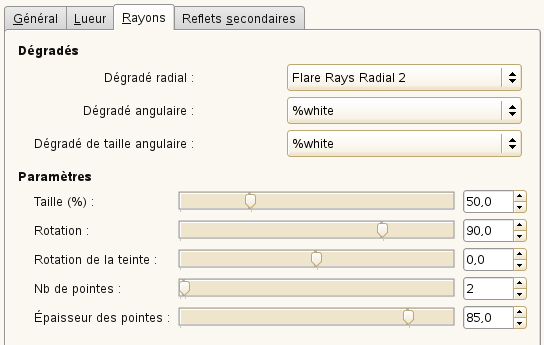 If luminosity is 100% (white), the radius is also 100%. Sets size of glow in percent (0-200). Sets the origin of the angular gradient (-180 +180). The options are the same as for Glow. This option determines the number of spikes (1-300) but also their texture. When spikes get wider (1-100), they look like flower petals. Options are the same as in Glow. Second flares, these satellites of the main flare, may have two shapes: Circle and Polygon. You can set the Number polygon sides. The option accepts 1 side (! ), not 2. The random generator will use this value as a seed to generate random numbers. You can use the same value to repeat the same « random » sequence several times. When you click on this button, you produce a random seed that will be used by the random generator. It is each time different.